Resin-coated sand is packed tightly around a pattern. The pattern is removed, and the molten metal is poured into the corresponding cavity. 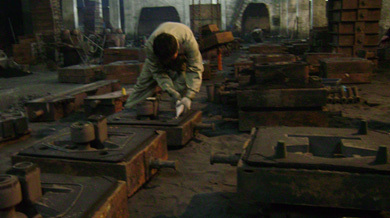 The sand casting process is one of the most affordable methods of creating a metal casting. Various high quality castings are made of gray iron, ductile iron, aluminum, steel, brass etc. Quality control checks are performed throughout the casting process form screening the raw material for stability the concentration of alloy and melted by the electric furnace. We analyze the chemical elements concentration of the alloy with spark spectrometer testing before casting¡£After casting and heat treatment we continue testing by metallurgical microstructure analysis, as well as checking tensile, impact strength and surface hardness by physical test and magnetic particle etc.